As I was rummaging through various pictures frames stored in our basement, I stumbled upon one with a photo card inside. 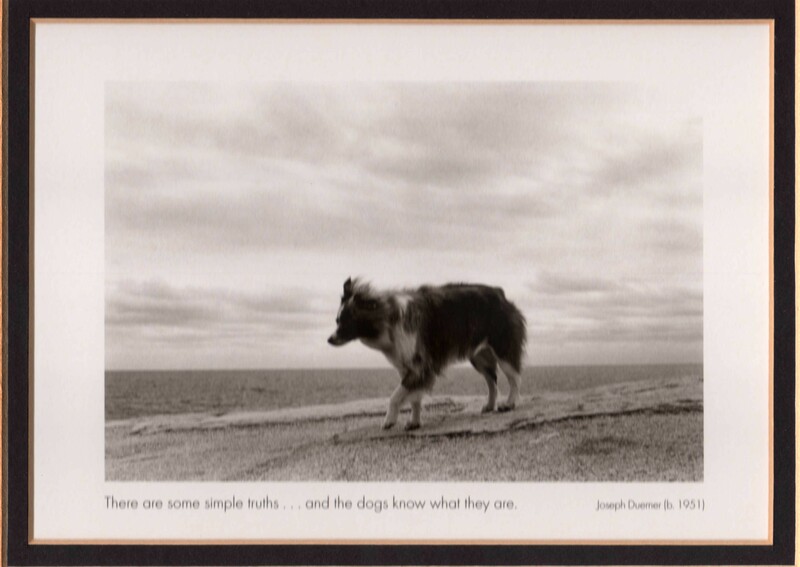 Looking back on all the canine loves of my life, starting with my first dog Lassie, I can see the importance in simple truths. Who better to know you, than your best friend – your dog? Dogs can sense when you’re sad. They lend a paw, or gaze at you with those big soulful eyes. It never fails, when tears trickle down your cheeks – they’re by your side to comfort you. Dogs don’t worry; but they are guarded. My heart dog, Sasha (who’s running free on Rainbow Bridge) had an uncanny way of accepting a human into her alliance. You passed the test if you were allowed to stroke her silky black and tan fur. Did I initially worry when this man approached? No. Thank goodness I had my little girl to figure things out. Because bad things can happen in an instant. A dog’s happiness is transparent. My little Aussie pooch likes to run figure eights at breakneck speeds around the tall pampas grass and the magnolia tree in the back yard. And certain ‘human’ words get those spirited canine legs moving even faster! Her joy fills me up. A treat, a toy, a loving glance…is all our furry friends need to make them happy. We choose to be happy, or not. Be happy. Sing a happy song. Read Stumbling on Happiness if you get the chance. And remember… dogs know the simple truths. This entry was posted in Books, Furry Friends, General, People, Photos, Things That Make You Think and tagged Australian Shepherds, best friend, dogs, happiness, heart dogs, intuition, Joseph Duemer, Philippians, photo, sadness, simple truths, worry by shereenielsen. Bookmark the permalink.